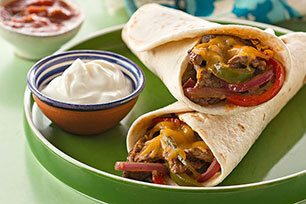 These saucy fajitas have a bold and smoky flavour thanks to BULL'S-EYE BOLD ORIGINAL Barbecue Sauce! Heat 1-1/2 tsp. oil in large deep skillet on medium-high heat. Add meat; stir-fry 1-1/2 min. or until done. Transfer to bowl; cover to keep warm. Heat remaining oil in skillet. Add vegetables and garlic; stir-fry 5 min. or until vegetables are crisp-tender. Mix barbecue sauce and lime juice; add to skillet. Cook and stir 30 sec. or until heated through. Stir in meat; spoon down centres of tortillas. Top with cheese; roll up. Sprinkle fajita filling with chopped fresh cilantro before rolling tortillas up. Serve with sour cream and salsa on the side. Stack tortillas; wrap in foil and warm in 350ºF oven 15 min. or just until warmed.